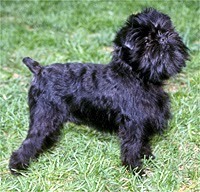 The affenpinscher lives up to his name,"monkey terrier", in both looks and actions. A terrier at heart, he is busy, inquisitive, bold and stubborn, but he also loves to monkey around, being playful and mischievous. He tends to bark and even climb. He is fairly good with other dogs and pets. This little dog is best with a family that likes entertainment and has a very good sense of humor. Although an energetic and active dog, the exercise needs of the affenpinscher can be met with vigorous indoor games or romps in the yard, or with short walks on leash. He enjoys playing outside, but cannot live outdoors. His harsh coat needs combing two or three times weekly, plus shaping every three months. Shaping for pets is by clipping or stripping.